I've not deliberately been taking part in the Tour de Fleece, but I have probably spun every day for the last few days. 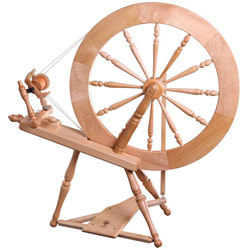 I enjoy winding down at the end of the day with an hour of spinning. For the last few hours of spinning, I've been enjoying the Librovox recording of 'Journey to the interior of the Earth'. It's my second Jules Verne and I'm addicted. I really didn't want that one to finish. I love the way that Verne includes geographic, scientific and historic details, not as part of the plot, but just for their own sake. I like that Librivox provide their books as podcasts - it makes it very easy to download and play the chapters. I also like that you get different (volunteer) voices reading different chapters. And while I've been enjoying that, I've been spinning Scout's 'wheatfield' (merino / silk) handspun. After a late session last night I had two very full bobbins. It's now plied but looking a bit underplied. 254 full turns of the niddy = 423 yards. I've given it a soak to fluff it up a bit and set it, then I'll wind it into balls before shipping. It's lovely. I look forward to the day when I have bobbins that will accommodate that much lovely yarn! How many Christmas presents is a Joy???? 3 years' worth min. I guess. I got caught up in one of those chain things on Facebook ("first five people to comment on this and post it as their own status will get a handmade present from me"). I'm thoroughly enjoying making the presents - it's motivating and rewarding.